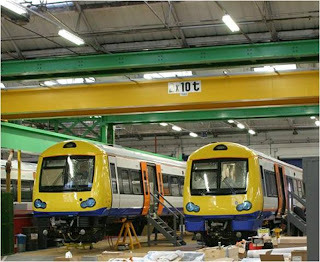 Willesden depot will see some new visitors arriving later this spring, with eight Class 172 arriving to replace the existing Class 150 fleet running between Gospel Oak and Barking. With transverse seating and wider aisles, the new two-car DMUs should increase overall capacity despite having fewer seats. Each of the new Bombardier trains, the latest in the Turbostar family, also features air conditioning, wheelchair ramps and on-board audiovisual customer information. Unlike the Class 150 units, the new trains won’t have gangways, but will have doors connecting the two cars. 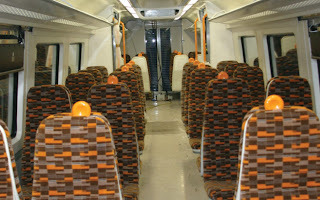 The Class 172s will be leased by London Overground Rail Operations Ltd (LOROL) rather than purchased outright, and their predecessors are due to be cascaded to East Midland Trains. 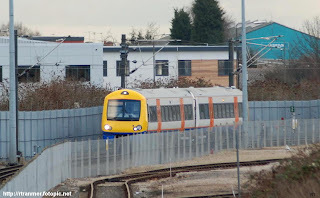 Ryan Tranmer has also managed to get several shots of the new Class 172s at Derby, including the example below, which can be found on his excellent Rolling Stock Gallery. Thanks to Dazz285 for the exterior shot, BW for the interior, and Ryan Tranmer for the running shot. Excellent photographs and comment for these very fine trains. they should have had a third coach between the two cab ended coaches. that would have made adequate trains from the start negated the need for this waste in electrification. i hope we see the Class 172s again soon. Please keep us all informed as to their future. Electric-hauled freight trains don’t count, presumably? The 172’s are all going to the West Midlands, for out-of-Birmingham services with lighter loadings. Too small but the 172s were almost certainly the most comfortable trains to have ever operated stopping services in Central London!